Slicingly cold horizontal rain forced at you by a very strong cold wind makes for. . .
. . . a very fast cycle journey home! 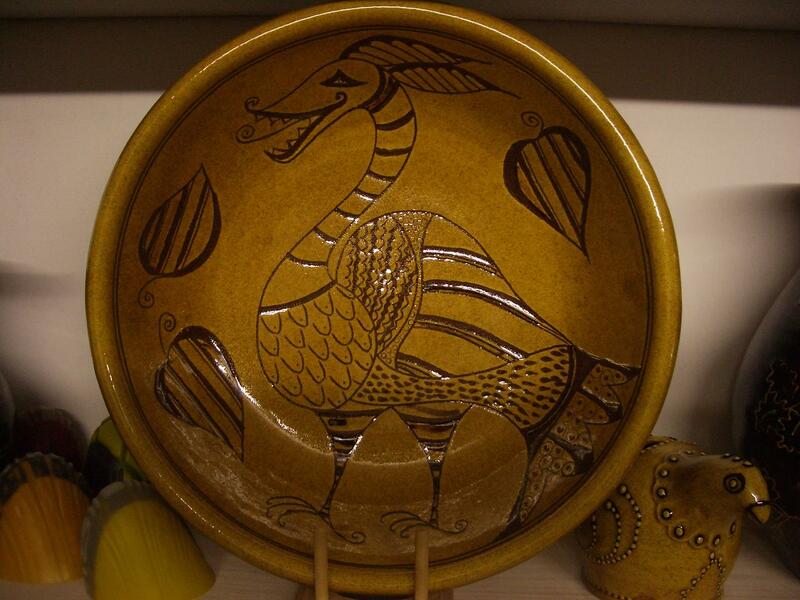 If I put this dragon dish on the other day I apologise but I couldn’t remember. I like him. More where he came from I think. 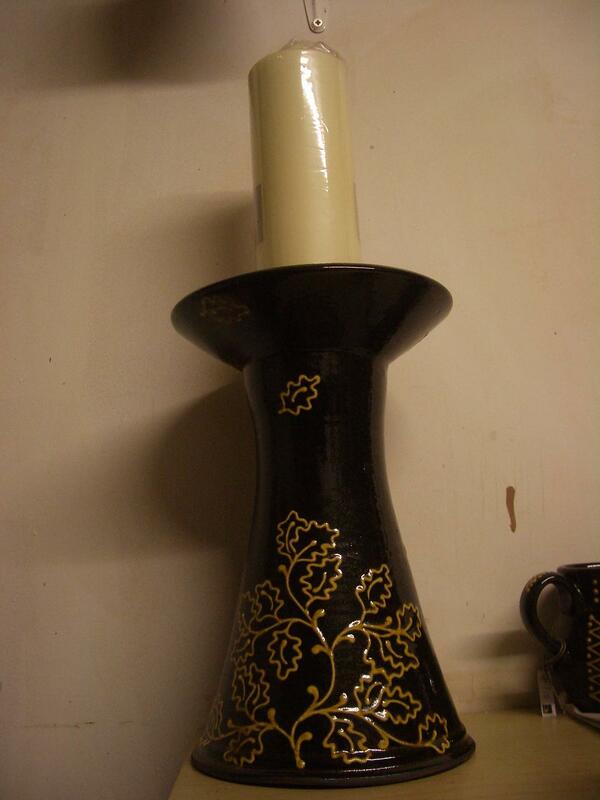 Another of my big candlesticks, this one is about 14″ tall I think roughly. I need to work on these, they are on my list of things to play with over the next couple of months. I have been having a slight disagreement with a gallery recently who had some of my work in a group exhibition in the summer. After the show they wanted to keep it telling me they thought they would be able to sell the rest of it. They haven’t sold any more since then so I rang to arrange to get it back. They wouldn’t pay for the postage to return it but eventually agreed to pack it ready for my courier which it then wasn’t done by the date she had originally said and another time had to be arranged though getting them to respond to an answer phone message was hard enough. I always make a point now of asking people to make sure work is packed in the manner in which it arrived with them I am possibly over cautious when I pack things up but I’ve spent a long time making it so I want it to get there safely. So it duly arrived here last week and I slit open the box and my heart sank because I could see parts of pots sticking out of a sprinkling of polystyrene chips and a smidgen of bubble wrap. Each pot and there were about 8 in the box had a piece of bubble wrap surrounding it which was about A4 size, and some of these things had handles and were quite big pots. Miraculously only one piece was broken, I was very very surprised by this but obviously still annoyed that even one had to be broken. The galleries response “well it was adequately packed when it left me so it’s your problem.” I could name them here but I’m not going to stoop that low however if anyone asks me if I know the gallery and would I recommend it then my response will be something less than positive. I haven’t had dealings with many such awkward people but it really leaves a sour taste when you do. Thank fully the rest of the people who have my work currently are much more conscientious and pleasant to deal with. This entry was posted in candlesticks, dragon, oak tree. Bookmark the permalink. 2 Responses to Slicingly cold horizontal rain forced at you by a very strong cold wind makes for. . . I was wondering if the dragon/bird dish was going to show up. I like it! Total bummer about the gallery. I'm getting ready to do some posts about that whole business and hope you'll chime in when the time comes. You know sometimes I feel like I'm just the shmuck stocking their shop. Those candle stick holders rock! Hello, fellow potter!It is a pity about the broken pot- not sure whose insurance would cover that, as they packed it. So many carriers wont cover anything remotely fragile.I used to work in a pottery in North Wales, and we had many breakages.The only way we could replicate this was….by using the box as a football!Keep potting!